the act of swallowing (second stage) induced by stimulation of the palate, fauces, or posterior pharyngeal wall. Swallowing caused by stimulation of the palate, fauces, or posterior pharyngeal wall. a sequence of reflexes that begins when a bolus of food is manipulated by the tongue and other oral cavity muscles to the palate or the pharynx. Synonym(s): pharyngeal reflex (1) . Act of swallowing (second stage) induced by stimulation of palate, fauces, or posterior pharyngeal wall. the taking in of a substance through the mouth and pharynx and into the esophagus. It is a combination of a voluntary act and a series of reflex actions. Once begun, the process operates automatically. Called also deglutition. difficulty in swallowing may be caused by foreign body obstruction, by inflammation of the lining or by a defect in nervous control. The nerves involved are the sensory and motor branches of the trigeminal nerve, the hypoglossal, the facial and the glossopharyngeal nerves. Called also dysphagia. begins as soon as the bolus of ingesta approaches the entry to the pharynx. 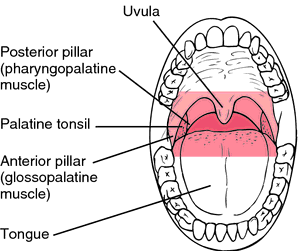 In a series of reflex actions: breathing is halted, the soft palate elevates and closes the entrance to the nasal cavities, the tongue is clamped into the fauces, closing the exit from the pharynx back into the mouth, the epiglottis closes off the larynx, the pharynx contracts and forces the bolus into the esophagus, peristalsis-like movements in the esophagus carry the food to the cardia which relaxes and the food is propelled into the stomach. Called also palatal reflex. a sign of partial esophageal obstruction. Significance of sensory inflow to the swallowing reflex. Voluntary and reflex influences on the initiation of swallowing reflex in man. Impact of thermal stimulation on the triggering of the swallowing reflex. The effects of the traditional Chinese medicine, "Banxia Houpo Tang (Hange-Koboku To)" on the swallowing reflex in Parkinson's disease. Some behavior analysts have researched procedures for prompting children to initiate the involuntary swallowing reflex (Hagopian, Farrell, & Amari, 1996; Hoch, Babbitt, Coe, Duncan & Trusty, 1995; Lamm & Greer, 1988). Effects of withdrawal of phasic lung inflation during normocapnia and hypercapnia on the swallowing reflex in humans. For children who appear to have an intact swallowing reflex, but who are not swallowing food, swallow induction training has been demonstrated to increase food acceptance and swallowing of food (Lamm & Greer, 1988). The better the swallowing reflex, the better an appliance will work. It is important to consider that diverting the flow of saliva to the back of the throat can create problems such as aspiration (choking) if a child has an abnormal swallowing reflex.